We all suffer from occasional bouts of madness. It is a hazard of being a human, a side effect of possessing a mind. We all have thoughts, wishes that cannot and should not be taken seriously. Mostly, we keep these thoughts to ourselves but sometimes, we blurt them out. If we are lucky, not many witness our moment of insanity. However, if you are someone with a fan following, if you are someone who motivates and inspires, someone who has a standing in society, you are expected to refrain from having public bouts of mental diarrhea. What to say then of Abdul Sattar Edhi who recently made a very public demand for a mass killing? Kill all corrupt political personalities, he has asked of General Kyani. Kill them so that the next generation can step into politics. The strange thing is Edhi made this call while opposing a bloody revolution. When I called Mr Edhi’s spokesperson Anwar Kazmi, to confirm the statement he said that Edhi was asked what could be done to improve the situation in Pakistan and he responded with the idea of a six month long martial law during which all the corrupt politicians are to be executed. I cannot decide what is more disturbing. The fact that he actually called for death, that this call was inspired by the recent violence in Karachi, or the fact that someone like Edhi believes that killing a couple of dozen people is the key to ending violence in Pakistan. What is it with these calls for murder? As if the crazy mullah’s weren’t enough for hate speech, now it seems like everyone is joining the bandwagon. Talk show hosts, politicians and now Edhi! We have been one of the world’s most volatile nations for a while, and now the mania seems to be catching the most unlikely suspects. I have heard demands like this before, but never from someone who celebrates life and humanity. I understand his sentiment, his frustration, but I cannot understand how someone like him could think the solution lies in the killing of some corrupt individuals. While I am disappointed by Mr Edhi’s demand, I am far more scared; if people like him, people who have previously helped and served everyone without passing judgments, without discrimination, are starting to think that military action and execution is actually a solution, we are in serious trouble. For decades a majority of Pakistanis have denounced violence. We have felt proud to be in this country even in its darkest hours and said these terrorists aren’t really us, we are peaceful. But today the best of us have supported a violent track. I know we don’t need any more violence, but when I go back to the question that made Abdul Sattar Edhi give this statement – what is the solution – I can come up with no answer that doesn’t involve excessive use of power and subsequent bloodshed. Am I the only one at a loss? Do feel Abdul Sattar Edhi's statements were justified? Yeah protect the politicians so they authorise rangers and Army to kill anyone with impunity. For Pakistan to prosper, the Army should make a secret death squad of assassins who have a license to kill. Then, all corrupt politicians should be given a 1-week deadline to return all their looted assets. Sadaf, your blog seems forced. It seems as if you had nothing to write about. So you chose Edhi, a man who should be respected by all, if not already. Imagine, Edhi, such a great philanthropic figure in our society, and then ooohh what a negative statement he made! perfect ingredient for some sensational news item. I’m sure you after reading the comments you must be saying “but i know how great Edhi is and he’s done so much for our people and our country etc etc. You guys arnt understandiong mee”. But come on, seriously. This blog seemed like a joke. Our parents and i’m sure your parents too voice their frustrations and be like “kab jayega ye Zardari” or “iss ko koi maar kyun nai deta”. But i feel that Edhi having said what he did is truly because he wants to see the country prosper. He is probably one of the few people who envisaged Pakistan BEING a welfare state and played his part magnificently in trying to acheive that in his own ‘small’ way. And yet, when after doing so much, after having such high hopes, only to see and realize that he can’t change our leaders and politicians who will always be a hindrance to what he imagined Pakistan to become, he has vented. I dont blame him. In fact its good that public figures like Edhi are making such comments. At least it makes its way to the ET blogs and people talk about it. What gives him the right to say that? Decades of selfless work. What gives you the right to judge him? Exactly nothing. Umm, I don’t see how death of such people is a solution. It may be a punishment, but why punish a person, punish their wrong notions so that others who think that way realize it and do not follow their footsteps. Yes, in short, but you shuoldn’t be at a loss. While Edhi is an amazing humanitarian, he is neither the voice of authority nor a diplomat. He is just angry like every other Pakistani who has to face sh*t all the damn time from politics and its resulting pessimism. You don’t expect rational answers from people who are frustrated, you should know that by now. What were you expecting him to do? Sing roses for the politicians? Bet that would not have made another ‘we expected better from you Edhi’ blog. Just take a moment and imagine What would you feel like picking bodies..riddled with bullets every day. not just one by in tens and at a bad day more than hundred. All in the name of political and ethnic killings. ever heard a mother cursing her own child to death when he gets too annoying, does she ever really mean that her child be dead the next moment? Sadaf, next time u’ll be writing about the violent streak of mother as anti human? what Edhi said is to be taken as a 90 year old’s rant for whom nerves are getting weaker and weaker to tolerate slightest corruption. this article was such a waste. Dude, it isn’t about “protecting” politicians but following the rule of civilized society. You have to show you are better than the animals, or you become one of them. Violence has lead to the escalation that is haunting Karachi today. @Imran: Wow, that’s a pretty extreme reaction. Just because you don’t agree with the writer’s views doesn’t mean that their motivation for putting the article together was sensationalism. That’s a giant leap you made there, buddy. I think what all of you are ignoring is the root of the problem. Even if you hang corrupt leaders like Zardari, Nawaz Sharif etc., do you think that will solve the problem? Did executing Bhutto in the 70s solve anything? The root of the problem isn’t the politicians, but the system which is being taken advantage of by those with wealth and power. You can kill all the corrupt today, but that won’t mean that future Zardaris and Bhuttos won’t be born tomorrow. Also, how do you judge who to kill and who to execute, when the law makers are controlled by those you wish to eliminate? The system is what needs to be killed. Let the gods judge the politicians if you don’t have the evidence to prosecute them. BTW, I think it is a fine article, this. The author acknowledges the services of Mr. Edhi to humanity, and tries to give him leeway for his extreme thoughts, but also expresses fear at what drives a noble person to such lows. I share with the author’s view at the dismay and utter shock to hear these words from MR. E himself. Any man (or woman) who has even a cursory look at the news and events of Pakistan would not call for the military to take over.. because lets be honest.. Mushie love us long time man!! Let the civilian government rule for a while too.. Secondly, for a General who who just got a second life-line using an extension not in his pants but in his years of service has no moral right to actually take over. Thirdly, when has the Army actually come for Three Months mister E?? Lastly but more importantly, why can’t we search for an amicable and political situation to the natural disaster that is Pakistan today. It’s cute that whitey has you so convinced that the LEGAL way is the right way to fix a country, especially in a place where court hearings can be shoved back to upto 12 years before they get addressed. Meanwhile no law restricts a man from becoming President while court cases are still pending on him. When asked to join politics our answer is NO but when asked to criticize politician we don’t waste a minute. What a hypocritical approach we have adopted. Sorry nothing more than another useless political correctness rampage. The writer is too romantic about this thing in Pakistan called democracy. Democracy is the best Revenge, yes it is & its playing out for the people of Pakistan (citizen) & for the ruling elite (AZ, NS & co.). The real blame of that is happening today should fall on the door of the so called civil society, so called media (especially Jang Group as a whole) & the lawyers. They fought for a corrupt & highly biased person & now we are paying the price of their doing. In my opinion, all political leaders who were killed or executed died for either Money or Power, not the people. I totally agree with Mr. Ehdi, because he feels the pain of the people, the writer does not ofcourse as she/he might not have lost a loved one to this senseless killings over flags, land or worst mere votes. I can only say one thing and that too with confidence. There is only man in Pakistan today who the people will blindly trust and follow, and that is Mr Edhi. If he were to stand up and start a mass movement against the Government, then at least 40% of the population will follow, and a majority of the poor people will definitely follow him. @ The author, rather than denouncing Edhi for his statements, think of it this way. What has caused a person like him, who has helped humanity his life, to pass such a radical statement? When a humanitarian like him, who everybody respects passes a statement like this, then this means that the situation has rapidly progressed to anarchy. All of us think this on a daily basis, no matter how good/bad we are. Then a man of his stature to say something like this means, that things really need to change. I’m with the great man on this one. It’s his frustration speaking. He has actions to back up all his statements ever – he’s pulled the country together with his efforts. But even he can’t keep up with all the deaths these politicians and they’re politics are causing, all the havoc this city is facing and does so every time one of them has a hiccup. Kill them all and a few rich families will – no, not mourn, but fight over who gets to keep what. Sadaf – well written. The supreme irony will be when Edhi ambulances are used to ferry the murdered politicians. what you can expect from Mr. EDHI is he simple human like us that have emotions and worries for a country like a simple normal Pakistani. If he made this statement then rather taking it to negative side you can even thought why a MAN such like EDBHI had made this statement. Ans: his nerves are also on the verge of break down. So dear author, think again, do politicians look like you a HUMAN from any side? simple explanation of this article is….. GET ALL THE CORRUPT POLITICIANS IN JAIL, and once the situation stabilizes get the new people in it, people who sincerely care for the well being of this country…..
frankly speaking this country is in an abysmal state right now, and it has reached this state because the politicians are corrupt, most of the people are ignorant, and the few who aren’t are kept down by these very politicians…..
You cannot be blamed for such a non sense of an article Sadaf. This is what the media is earning from now a days. You guys are so busy in spicing things up that you ignore the intrests of Pakistan in doing so. Just go through the history and see how revolutions can change the complete picture. On one side everyone agrees that pakistan is facing the worst time of its history, on the other hand we just dont want to make any decision. Ask those whose sons are being killed without any reason and the people planning it are seen giving the speeches on humanity!!!! All I assume is that you are far from reality and grave situation of karachi and consequently the country!! I sincerely request you to please think for a little while prior to posting such things. Abdul Sattar Edhi is undoubtly among the most humane people in our country and very close to the public. This statement from him is just an expression on behalf of the common people; those who are bearing the heat of it all and those who are losing their family members. heres a man whos dedicated his live to better his country.. to better his people and all he has seen in return is our leaders do the exact opposite….does he not deserve to get upset and say whats on everyones mind? When you are talking about politics, try to keep your emotions aside, and everything that can cause bias, including the consideration as to who said this and things like that. Try to evaluate everything on the basis of pure logic. Lets do that. Unfortunately, if we look at the situation that has been in Karachi for quite some time, points the ruling class to be responsible for it. Whenever you have a law and order situation like that, you must rush to increase the amount of law enforcement personnel at the place. Unfortunately, this was not done till it was very late. Don’t you think that these people sitting comfortably escaping from taxes and the duties they willingly assign themselves, are responsible for the deaths of these many people? Don’t you think that this situation can arise again if these politicians keep sitting like that? Don’t you think the people who were killed in Karachi by stray bullets had some right to live? Do you think that this bloodshed that happened was not bloodshed? Sometimes, it is necessary to have a minor loss to avoid a bigger loss, its common sense! And i don’t consider killing all these politicians a loss at all, I have just considered it because I think that you do so. Now, just consider how good Pakistan will be without these corruption hungry people. During the last government’s era (Musharraf’s Regime), only a few of them were sent out, and the results were far reaching,. Pakistan was Asia’s economy tiger in 2005. The prices of petrol, dollar and everything else were maintained throughout his 10 year dictatorship. Many new universities were built. HEC funded a huge amount of scholarships for our students abroad. A lot of investment was brought into Pakistan. Did you guys even read? “when I go back to the question that made Abdul Sattar Edhi give this statement – what is the solution – I can come up with no answer that doesn’t involve excessive use of power and subsequent bloodshed. Does any one understand what it means? 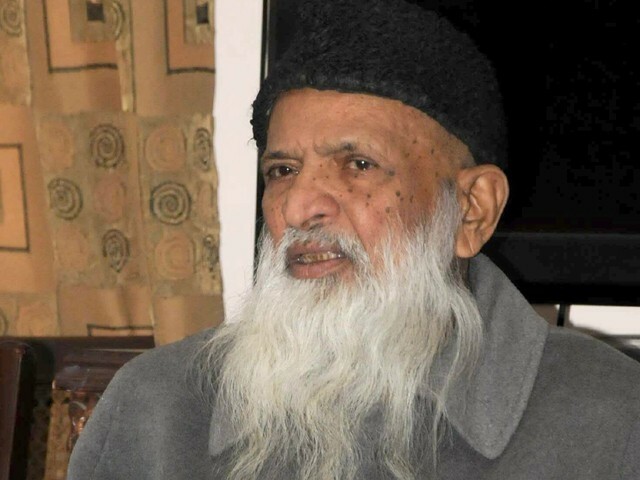 So basically Edhi just called about 500 people Wajibul Qatal – and we say that is okay? I respect Edhi. He is a great man. But this statement is unacceptable, No one can say it is okay to kill another person because they were corrupt. 1. That is not a crime that merits the death sentence. 3. To those who say he was misquoted – the blogger confirmed the quote. I agree with you Sadaf and am deeply disappointed by what Edhi said. He was one of the very few people who we could take pride in mentioning to the outside world. So much for that! Killing to stop killing, how ridiculous is that! What is more ridiculous is that more people in your poll believe that Edhi is justified in what he said! We civilians break every law of the state on daily basis, yet we blame others for our miseries as a nation. Edhi does not have the guts to say “Kill the corrupt people in Army too.” If he had said that, I would have agreed with him. I’m sorry but the point of Education, Awareness and Intelligence is to allow human beings to look beyond words; to choose perceptions and formulate judgments without letting prejudice or verdicts block our views. Uh, no. There’s NO error in judgement or misunderstanding in what you wrote, because of one simple sentence: ‘We expected better from you’. Expected? 50 years of picking up the dead bodies no one else did, feeding hungry no one else would, clothing the naked no one else could, and you EXPECT MORE from him? Army is a part of the problem, not a solution to it. “Killing all politicians” would only allow army to gain monopoly on sucking the life out of this nation. Every Ying needs a Yang to maintain balance and accountability.